Ayer & Co., 1¢ black, silk paper, type 1, ample to large margins, bright and fresh, light vertical crease and small thin, Very Fine appearance. 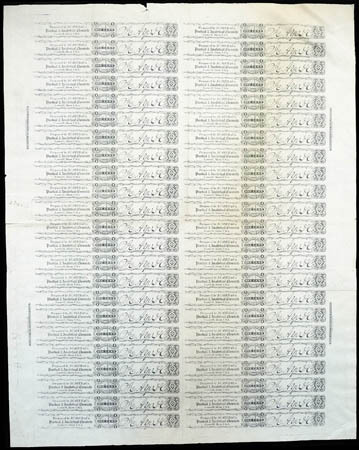 Ayer & Co., 1¢ black, silk paper, type 2, complete sheet of 46 with N.B.N.Co. 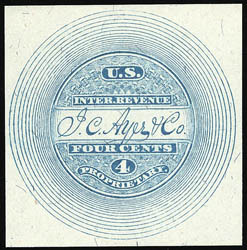 imprints at sides, without gum, strong color and sharp impression, pen outline around position 22 stamp with dimensions at left, flaws including folds and some selvage tears at top, Very Fine appearance. Scott No. RS4g $9,200 for singles. 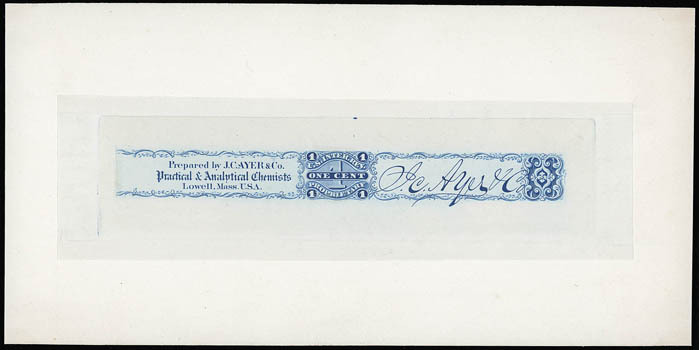 A REMARKABLE COMPLETE SHEET OF THE AYER & CO. 1¢ ON SILK PAPER. 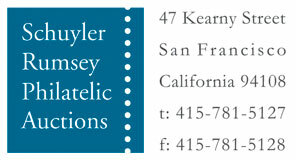 Ayer & Co., 1¢ blue, large die proof, on India die sunk on card (210x105mm), fresh and pristine, Very Fine and choice. 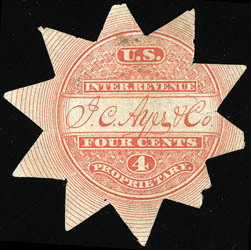 Ayer & Co., 4¢ red, old paper, die cut, strong color, small tears, thin and missing point at lower right, Fine appearance, a great Match & Medicine rarity, with only 3 examples reported in the Aldrich census (with only one considered sound), ex-Joyce. 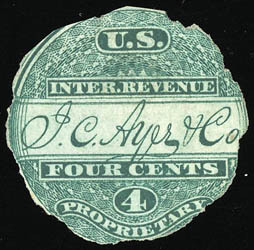 Ayer & Co., 4¢ black, trial color large die proof, on India, stamp size with wide margins, deep color, very fresh, natural translucent spot at top left corner, Very Fine, ex-Cunliffe. 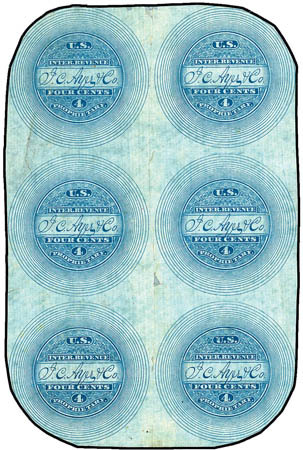 Ayer & Co., 4¢ blue, imperf, old paper, block of 6 rejoined vertically, strong bright color, corners trimmed into stamps and other small flaws, Fine appearance, a very rare multiple. 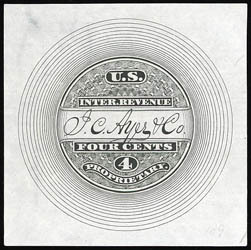 Ayer & Co., 4¢ blue, imperf, silk paper, full even margins, bright color, Very Fine. 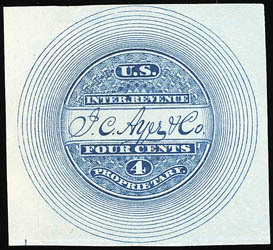 Ayer & Co., 4¢ blue, imperf, watermarked USIR, clear to large margins, fresh with rich color, small filled thin, otherwise Very Fine. Ayer & Co., 4¢ green, old paper, die cut, cut-to-shape removing points, deep color, Decent Appearance, a presentable example of this great rarity, only 2 examples are recorded in the Aldrich census not counting this recently resurfaced example, ex-Springer; with 2002 P.S.E. certificate.